Fenghao (simplified Chinese: 沣镐; traditional Chinese: 灃鎬; pinyin: Fēnghào) is the modern name of the twin city formed by the Western Zhou capitals of Feng and Hao on opposite banks of the Feng River near its confluence with the Wei River in Shaanxi, China. As Duke Wen (ruled c. 1099–1050 BCE) expanded the territory of Zhou east into Shanxi in preparation for an assault on his nominal Shang overlords, he constructed a new capital on the west bank of the Feng about 100 kilometres (62 mi) downstream from Zhou's original capital on the Wei River below Mount Qi. This city was called Feng, Fengxi or Fengjing (灃京, Fēngjīng). 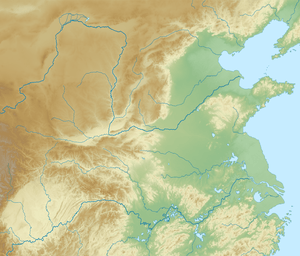 After his son Fa defeated the Shang at Muye and ascended the throne as King Wu (ruled c. 1046–1043 BCE), the capital was moved to a new establishment on the east bank called Hao or Haojing. The two formed a twin capital, with Feng continuing to serve the rituals of the Zhou Ancestral Shrine and gardens and Hao containing the royal palace and government administration. Both were abandoned in 771 BC during the Quanrong invasion that drove the Zhou out of the Wei River valley and brought an end to its Western dynasty. The capital of the Eastern Zhou was located at Chengzhou. The ruins of Fenghao lie in present-day southwest Xi'an in Shaanxi Province. The site was declared an important national cultural heritage site by the State Council of the People's Republic of China in 1961. This article is based on a translation of "沣镐" in the Chinese Wikipedia. This article is issued from Wikipedia - version of the 8/14/2015. The text is available under the Creative Commons Attribution/Share Alike but additional terms may apply for the media files.